Planting the idea of a smoke-free home among Arab families, training managers of Jerusalem community centers to become health advocates, and educating human resources managers in government ministries to promote a healthier work environment are some of the latest initiatives of the Hadassah Medical Organization’s Linda Joy Pollin Cardiovascular Wellness Center for Women, which continues to expand its impact. The smoke-free home campaign begins with a study in the Arab community entitled “Assessment of Barriers and Opportunities as a First Step for the Development of a Community-Based Smoke-Free Home Initiative.” In partnership with an expert in quantitative evaluation, the Pollin Center hopes to address the problem of Arab women and children being at great risk for heart disease because of passive smoking in their homes. More than 50 percent of Arab men smoke and the majority smoke in the home. The Israel Cancer Association has awarded the Pollin Center a 25,000-shekel grant toward implementation of this project. 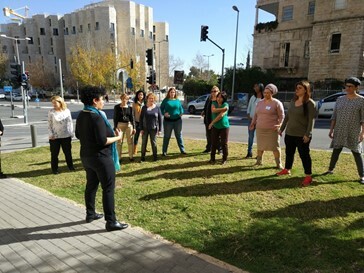 In partnership with the City of Jerusalem and Israel’s Ministry of Health, the Pollin Center aims to train the managers of local community centers and their designated health promotion coordinators to become health promotion advocates. Understanding that the local community centers are responsible for local urban planning and the interaction between local citizens and the City, the Pollin Center is implementing a 12-session program for leaders of 14 neighborhood community centers. In addition to the hands-on training segment, this project provides graduates with funding to implement their first neighborhood-wide health promotion project, funded by the Jerusalem municipality and the Ministry of Health. Following its first Health Promotion in the Workplace training program in 2017, the Pollin Center received a request from the senior human resources manager in charge of the Civil Service Commission to train human resources managers from additional government ministries. The Civil Service Commission is responsible for managing the employment of all civil servants. Its main functions are the management of standards of government ministries, the absorption and appointment of employees, and promoting the welfare of civil servants. The current Pollin Center course has representatives from the Ministries of Energy, Health, Education, Labor, Welfare, and Absorption, and the Prime Minister’s office. In addition, the Office for Communications with FSU (Former Soviet Union) Jews, The Jerusalem Health Agency, Courts System Management, Israel Land Authority, Dorot Hospital, Enforcement and Collections office, and the Antitrust Authorities are all involved in Pollin Center health promotion courses. Pollin is now recruiting partners for the next Health Promotion in the Workplace program, which will be conducted in Southern Israel. Read about Pollin’s earlier Health Promotion in the Workplace programs. Read more about the Pollin’s Center’s first five years.